Want truly clean funk-free workout clothes? No sweat! The cleanliness posts just keep coming! (Seriously — we’re like obsessed lately.) But, if you’ve ever had to re-wash — or even toss — a workout top or a pair of shorts due to them smelling too funky for words, then you know just how important this topic is. Like Tish said in her recent Fit Tip Friday, you pay good money for your workout clothes, and it’s important to take care of them. 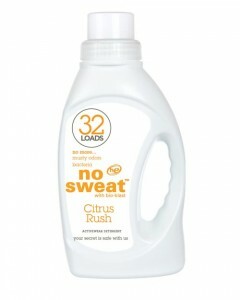 Which is where No Sweat activewear detergent comes in handy. They recently sent us a few bottles to try, and we put it to the sweaty, sweaty test. Made specifically for your workout clothes, No Sweat is an anti-bacterial laundry detergent that uses enzyme-technology to dissolve protein-based grime. Although it’s tough on sweat, stains and general funkiness, the detergent is EcoLogo-audited, meaning that it adheres to the highest environmental standards for laundry products and is gentle on good ol’ Mother Nature. We dig that. The company offers two scents of activewear detergent and yoga mat spray — Citrus Rush and Sweet Freesia — and we tried both of them. Pleasant and fresh, the Citrus Rush kind of makes you want to go for a run. A clean run! And the Sweet Freesia is a little more flowery and fresh. It makes you want to go into down down dog and say “om.” No Sweat also offers a fragrance-free option. Highly concentrated, you only need ONE ounce for a load of laundry — and just that little bit really does get your workout clothes clean and smelling good. No stiffness, no pilling, no color fading; just clean, de-funkified workout clothes. I was pretty impressed. The Mat Spray was nice, too. You simply spray it on your mat after using it and let it air dry to keep stinkiness and bacteria away. I sprayed down my usual yoga mat (new fitness confession: I never clean that thing! ), and it came out smelling great without any stickiness. This stuff costs more than your usual laundry detergent (about $16 for 32 loads — the Mat Spray comes in a $23 pack), but you have to factor in that it’s both a specialty product and one that’s eco-friendly. Plus, it may make those pricey workout-apparel purchases last, which certainly pays off in the long run! OMG this would seriously come in handy for my bf’s nasty sweaty workout clothes! I swear sometimes he just smells like an onion. Haha! I so need this! My workout clothes STINK, no matter how much I wash them. Guess that’s what I get for so much running and cycling 🙂 Thanks for sharing your thoughts on this. I’ll have to check it out. I’ve used something similar called Sweat X and it completely rocks!! Not sure what I did before it… probably walked around all stinky 😉 When I compared Sweat X to my regular detergent, I found that it actually cost LESS per load because of the concentrated formula – I would ALWAYS fill that LARGE cap of my old detergent to the brim!! Which makes me wonder if that’s the reason they make the cap so big? But I guess that’s a debate for another time 🙂 I also like that Sweat X has a neutral pH so I can use it on everyone’s clothes in the household – even the ones with sensitive skin.